Most robotic manipulators use harmonic drives. A harmonic drive is a compact gearing system that achieves very large gear ratios, at the price of elasticity. For instance, large harmonic drives cause Canadarm and Canadarm2 to have a tremendous amount of joint flexibility. Chris is interested in precision control of rigid-link flexible-joint robots, where the tip position is kept within millimeter accuracy by actively compensating for all the flexibility in the joints. Chris has a flexible-joint robot built by Quanser in his lab (pictured here) where the elasticity comes from actual springs in the joints. This is an excellent platform for testing advanced control systems. Here are links to some of the group's publications on control of flexible-joint robots. Macnab Publications Macnab, C.J.B. Finding a near-optimal neural-adaptive control solution without increasing the training time. Macnab, C.J.B. and S. Razmi, Control of a flexible-joint robot using a stable adaptive introspective CMAC. Macnab, C.J.B. Preventing overlearning in CMAC by using a short-term memory. Macnab, C.J.B. Creating a CMAC with overlapping basis functions in order to prevent weight drift. Vol 21, No. 16, pp. 4593-4600, 2017. R. L'Orsa and C. J. B. Macnab. 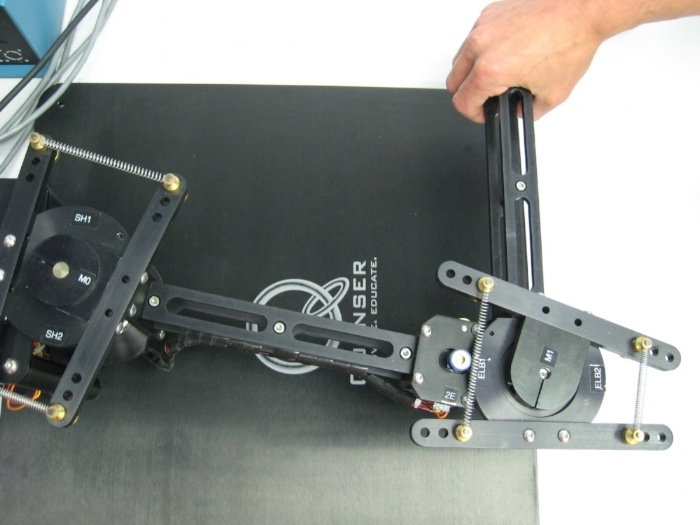 Experimental evaluation of adaptive CMAC haptic control for teleoperation of compliant-joint manipulators. (Edinburgh), pp. 1087 - 1092, 2017. Vol. 136, pp. 300–314, 2014. Richert, D., K. Masaud, and C. J. B. Macnab. Discrete-time weight updates in neural-adaptive control. Vol. 17, No. 3, pp. 431-444, 2013. Macnab, C.J.B., Neural-adaptive control using alternate weights. Vol. 20, No. 2, pp. 211-231, 2011. Macnab, C.J.B. Improved output tracking of a ﬂexible-joint arm using neural networks. Vol. 32 (2), pp. 201-218, 2010. Macnab, C.J.B, Preventing bursting in approximate adaptive control when using local basis functions. Macnab, C.J.B, A new robust weight update for multilayer-perceptron adaptive control. Vol. 35, No. 3, pp. 279-288, 2007. Macnab, C.J.B, Robust associative-memory adaptive control in the presence of persistent oscillations. Macnab, C.J.B., Direct neural-adaptive control with quantifiable bounds and improved performance. (Vancouver), pp. 4456- 4462, 2006. Macnab, C.J.B, A new robust weight update for neural-network control. (Cambridge, Mass.) pp. 360-367, 2005. Macnab, C.J.B., Local basis functions in adaptive control of elastic systems. (Niagara Falls) pp. 19 - 25, 2005. Macnab, C.J.B., Getting weights to behave themselves: Achieving stability and performance in neural-adaptive control when inputs oscillate. (Portland, Oregon) pp. 3192 - 3197, 2005. Macnab, C.J.B., D'Eleuterio, G.M.T., and Meng, M., CMAC neurocontrol of elastic-joint robots using backstepping with tuning functions. (New Orleans), pp. 2679 - 2686, 2004. Macnab, C.J.B., D'Eleuterio, G.M.T., Neuroadaptive control of elastic-joint robots using robust performance enhancement. vol. 19, no. 6, pp. 619-629, Sept. 2001. Macnab, C.J.B., D'Eleuterio, G.M.T., Discrete-time Lyapunov design for neuroadaptive control of elastic-joint robots. vol. 19, no. 5, pp. 511-525, May 2000. Macnab, C.J.B., D'Eleuterio, G.M.T., Meng, M., Using backstepping for control of elastic-joint robots with smaller gear ratios. (Edmonton, Alberta), pp. 873 - 878, 1999. Macnab, C.J.B., D'Eleuterio, G.M.T., Stable, on-line learning using CMACs for neuroadaptive tracking control of flexible joint manipulators. (Leuven, Belgium) 1, pp. 511-517, 1998.